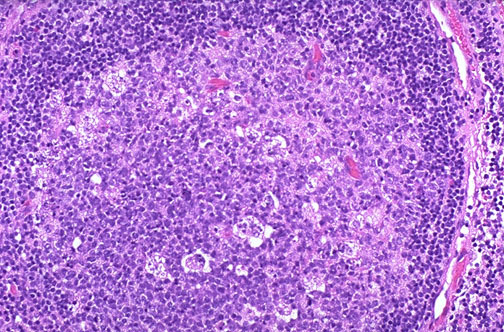 This is a more pronounced reactive change in a lymph node, with a larger follicle and germinal center containing 'tingible body' macrophages. These large macrophages are involved in phagocytosis of antigenic material passed from follicular dendritic cells to be processed into peptides. In general, lymph nodes in a benign reactive process are more likely to enlarge quickly and become tender.